Even though Baby is still pretty small, he (or she--but I'll say "he" for simplicity) doesn't like to be squished. But I'm not quite ready for maternity clothes yet; I bet even non-pregnant people look pregnant in those things. In my perfect world, maternity clothes would work for non-maternity just as well. It's an impossible dream much of the time, but not with this skirt. 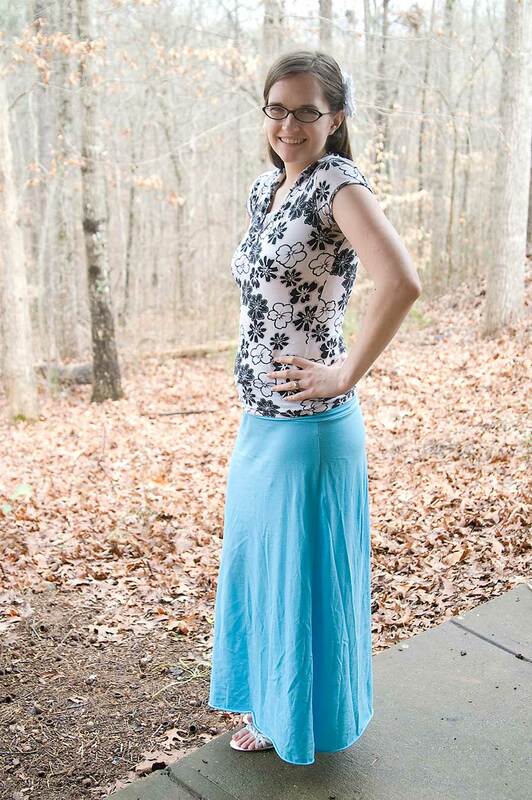 This skirt is long, yet light (great because this will be my second pregnant-through-the-hot-humid-summer experience), and so comfy! And easy to make--it was a great beginner project. And I love that it works even with a tiny baby bump, will still fit with a big baby, and will transition back to no bump without another shopping trip. I'm super pleased. I may make myself another skirt or two, now that I've got some practice. I followed this tutorial from Elle Apparel. 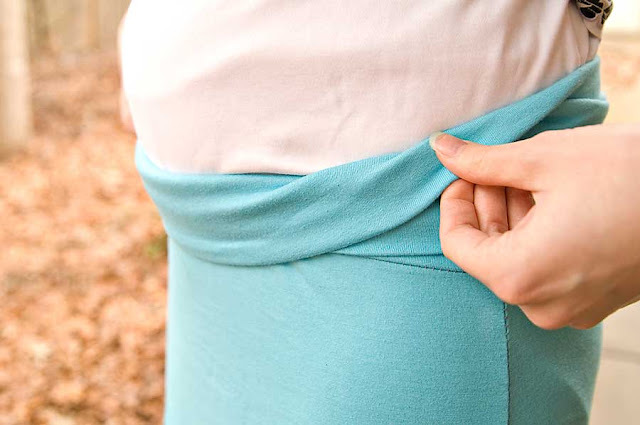 I used jersey knit, and measured my "waist" right under my baby bump. I hope to post more maternity things as my pregnancy moves along, and if you know of some great maternity-themed tutorials, I'd love to hear about them! I like your pictures here. Well mostly the first one. Sweet Jill I need to make me one too because I will be doing the summer thing as well! Could we make it shorter, as in a few inches below the knee? or would that look funny? I'm sure a knee-length skirt would look great, too. I'm actually planning on making one, myself. I just love this skirt! So far, I have made two long skirts and I have the fabric for a third--shorter--skirt.